Plays a key role in glycolysis and gluconeogenesis. 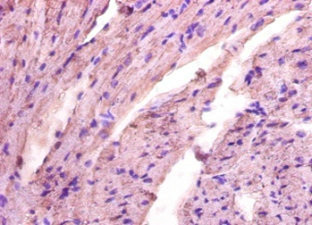 In addition, may also function as scaffolding protein .Defects in ALDOA are the cause of glycogen storage disease type 12 (GSD12) [MIM:611881]; also known as red cell aldolase deficiency. A metabolic disorder associated with increased hepatic glycogen and hemolytic anemia. It may lead to myopathy with exercise intolerance and rhabdomyolysis.Belongs to the class I fructose-bisphosphate aldolase family. 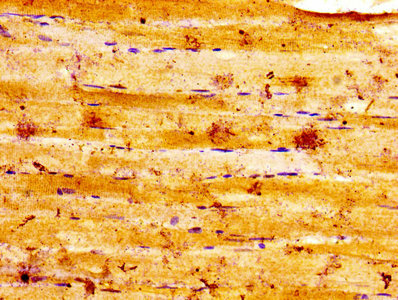 IHC image of CSB-PA00015A0Rb diluted at 1:100 and staining in paraffin-embedded human skeletal muscle tissue performed on a Leica BondTM system. After dewaxing and hydration, antigen retrieval was mediated by high pressure in a citrate buffer (pH 6.0). Section was blocked with 10% normal goat serum 30min at RT. Then primary antibody (1% BSA) was incubated at 4°C overnight. The primary is detected by a biotinylated secondary antibody and visualized using an HRP conjugated SP system.